The Back-to-School seasonal pages will provide you with great resources to help you get your year started off right. Ideas within the back-to-school pages include: "get to know you" and ice-breaker, assembly ideas, first day lessons, and bulletin board ideas. Your creativity can help other teachers. Submit your Back to School activity today. Don't forget to include additional resources-documents, web sites, or a photo. Literature (Amazon) - We have created a collection of Back to School Books for both teachers and students. This link takes you to our list of books on Amazon. Here is a great form to use at the beginning of the school year to gather information regarding your students. Find great ideas. Also visit the August Bulletin Boards page! 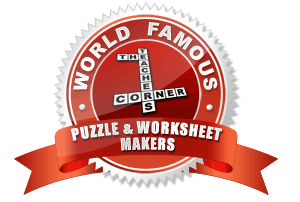 Check out our large selection of World Famous "make your own" worksheets! Quickly make fun Back to School crosswords, word search puzzles, word scrambles, match-ups and other great puzzles. Word Search Maker Idea: Use our word search maker and use student names as the words. Premade school list. Crossword Maker Idea: Use our crossword maker to make classroom rules fun, or a fun way to test current knowledge on a subject! Word Scramble Maker: Use the word scramble maker to scramble student names or basic school supplies. Premade school list. Brain Teasers: These can be a really fun way to provoke discussion and creative thinking. Examples: "Before Mt. Everest was discovered, what was the highest mountain in the world?" and "Which came first, the chicken or the egg?" - the answer to this one is The Egg. Find out why this is true in our brain teasers! Advise parents to put labels with the child's name and address on all personal belongings they bring from home. There are places online to buy personalized sticker labels. This page has all sorts of activities for Fall. Divide the group into teams of 8 to 12 students. Have each person join right hands with another person in the group, but it has to be someone who is NOT standing immediately to the left or right. Then have each person join left hands with another person in the group, but it has to be someone who is NOT standing immediately to the left or right and someone other than before. Now the groups have to untangle themselves without letting go of hands. They may have to loosen their grips a little for twisting and turning. They may have to step over or under other people. The first group to untangle their knot is the winner. SPECIAL NOTE: There are four possible solutions to the knot. One large circle with people facing either direction. Here are several "Welcome Back" themes that can be used in a school assembly. Help students understand the importance of thinking before they speak. I just went to an inservice that did an interesting thing in the beginning. The instructor asked for a volunteer to come up. She was handed a tube of toothpaste to squeeze out all over a piece of construction paper. The volunteer squeezed it all out. Then the instructor asked her to put it back in the tube. The volunteer said she couldn't. Then she was thanked and sat down. The instructor said the toothpaste symbolized words that are said and they cannot be taken back. It is "out there" and no apology can erase it. I thought this would be a good beginning of the year demonstration. I think I'm going to use it to remind my class to be more careful with their words. A great way to get parents involved in the new year. The homework I assign for the first week of school is for the kids to go home and ask their parents, discuss with them or think about how they use reading, math, language, science, and S.S. during the day. Each day I focus on a different subject. If the focus is reading then they go home and ask their parents what they read that day and why being able to read was important or useful to them that day. The next day we create a large poster with all the uses listed. Help your parents and students become familiar with the classroom. At our Open House/Orientation for the children, my kids do a scavenger hunt to familiarize them with the class. They find the pencil sharpener, certain books, their desk etc. It is a terrific ice breaker really encourages them to mingle with others. A fun way for students to not only learn about you, but to also learn about each other. At the beginning of the year, I introduce myself using 'Me In A Bag.' I put a few items that represent me in a large paper sack. In my sack, I put a paintbrush because I'm an artist, my favorite book, my favorite food, pictures of my family and my pets, my favorite CD and a cookbook. The children sit around me, and I explain the significance of each item as I pull it out of the bag. This discussion helps the kids get to know me as a person. Each child then has a turn to bring in his/her own 'Me In A Bag,' giving everyone in the class a chance to shine." Submitted by: Jan Formisano , a second grade teacher in Falls Church, Virginia. This tip was published in the NEA's Weekly "Works4Me" Email list. This is a great way for parents to share their concerns and expectations with you. "I give parents a homework assignment within the first two weeks of school. I ask them to write me a letter about their expectations for their child in the coming year. I explain that it can include emotional needs, physical needs, academic areas and any information about past experiences that did or did not work well for them. I refer to the letters during conferences and return them at the end of the year. It gives me great insight to begin the year, and in most cases the parents see their goals for the year touched upon in some way." Submitted by: Patti Donnelly [email protected] , a second and third grade teacher at Ephesus Elementary School in Chapel Hill, North Carolina. This tip was published in the NEA's Weekly "Works4Me" Email list. This can be an amusing first day activity. It also helps your students learn more about each other. On the first day of school, I pass around a roll of toilet tissue. I do not tell them what they will be using it for but explain that they should tear off as much as they need. Later, we count the amount of squares and then in a group, each student tell us one thing about himself for each square of toilet tissue. This is a great "ice-breaker" and the students get a laugh out of it! This is a great activity for the beginning of school that can be displayed for an open house. "The first assignment I give each school year is to have my students describe themselves in eight or fewer letters and/or numbers. I give them a license plate template and tell them that they need to create a personal plate that best describes an important aspect of their character. They decorate their plates and explain why their choice of letters or numbers fits them. I post the plates around the room so they get to see what their classmates say about themselves. The license plates are always a big hit at parent open house." Submitted by: Sue Schmitt [email protected] , an English teacher at Antioch Community High School in Antioch, Illinois. This tip was published in the NEA's Weekly "Works4Me" Email list. This are hand-on activities to allow students to review upcoming concepts and do quick assessments. My reading activity is to have them look through their reader and find a story that interests them and jot down the title and a reason or two why they feel this way. They share with the class. We also go through the book and we categorize the stories according to what kind of reading material it is. Poetry, historical fiction, biographical, informational, folklore, etc. We graph the results. I do the same for math. I have them look through the book and tell me what they think they will be studying in math this year. I list these on a poster board. We also talk about what concept(s) are dealt with the longest. Get your students off on the right foot. I ask my students write the school rules and classroom rules. We do this together rather than me just telling them and posting them. Getting them involved in doing this seems to make them feel in a way that they should not break the rules they made themselves. Of course the rules are the ones I would have posted anyway. An activity to help get your students familiar with their text books, as well as to complete a KWL. I divide the class into several groups of four and have them browse through their Social Studies text. Each group is assigned a different chapter. They fill out a sheet that asks what the chapter is about (Title), What they already know about the chapter, what they would like to find out, and what they think they will learn by reading it. KWL - Each group shares their results with the class. We put their sheets in a class book and when I begin the chapter I read the group's comments to the class. Learn student names easily and have a resource for the entire year. I have each student's name and picture on a 3x5" index card on a ring. I use the previous year's pix which are in my school's office. These are then used in the classroom to call on children so that I am more apt to call on each student. Subs love them because they can put a face to a name. Because I teach 2 classes of math, both classes are on a ring and I use different color cards for each class. Visit this site to take advantage of their Back-to-School Thematic Unit. Over 100,000 professionally written problems and thousands of distinct practice tests across 150 subjects. This includes subjects like foreign languages, history, math, and science at all levels of sophistication. We also have thousands of practice tests and problems for Common Core and standardized tests like the ACT, SAT, GRE, GMAT, LSAT, MCAT, ISEE, and SSAT. Each question is tied to a specific academic concept, which means that students can pinpoint their particular strengths and weaknesses in almost any area. The platform also includes free web-based classroom assessment software. Make up a short list of statements for children to find someone to match with (i.e. someone who has sandals on, someone who likes chocolate milk). If you can come up with at least the number of statements as you have children then you can add the rule that they must collect a different name for each one. Example statements: someone who has white socks, someone who has a little sister, someone who doesn't like strawberries, someone who can say hello in another language etc. A creative way for students to start the first day of school. Before the first day I cut out apple shapes from oak tag. These are colored ( I admit my daughter helps with this part) and I put a student's name on each apple. On the back, I pencil in the child's name on the stem. I cut each apple in half starting at different places and using different scissors and paper edgers. I put the half without the stem on a desk. On the first day I greet each child at the door and give him/her the stem half of the apple. The child must find his seat by finding the matching half. A colorful and creative way to help your young students learn the days of the week. I drew on large Pizza pie circles. I drew the following characters for each day of the week. In order to get the pictures to show up nicely, I painted them with bright colors! They look nice in front of my class and we use the words daily. Tuesday and Thursday are the two days first graders get mixed up knowing! Then we have a good lesson on "T" and "TH"
Read stories and eat the gingerbread man! We start the year with The Gingerbread theme. We have a Gingerbread Hunt. We read stories all week. Make gingerbread man on Friday. He jumps out of oven and runs all around the school. He leaves us notes in the office, library, art room and finally the principals office. They have a ball. We take him bake and eat him. Start creating this parent keepsake on the first day of school. At the beginning of school, I take pictures of my students and measure them. They draw a picture of themselves, record the date, and copy a sentence about how tall they are. I display the pictures for open house. We have a height chart near the door so students can compare themselves to their September height throughout the year. At the end of school, I measure the children again. They draw a new picture and write a comparison of their earlier height to their present height. Besides their physical growth, they notice their cognitive growth in penmanship and drawing from the beginning of the year. Many parents have thanked me for this keepsake. Submitted by: Roxie Ross , a first grade teacher at Napier Elementary School in Nashville, Tennessee. This tip was published in the NEA's Weekly "Works4Me" Email list. Look at several ideas for Seasons. Set a positive tone in your classroom early. We talk about respect and then the students set three "respect" goals for the year: "I will respect myself by -------," I will respect others by ---------------" and "I will respect our (school) environment by ---" They also set 3 other goals of their own choosing (I push at least one academic one!) and all 6 are written down on a white cloud-shaped paper. We attach a different colored streamer to each to make a rainbow. The clouds are then glued onto a rainbow-shaded paper to which the student's picture has been glued. I hang them around the room -- they look great, and the kids like reading each others' goals. 1. Have students finish the following sentence (dictation is OK! ): "Today is the first day of _____ grade. The part I liked best was __________." On the last day of school we do a similar paper, then I send both home. 2. We do a self portrait on one of the first days of school. I hang them up at Back-to-School Night. We do another at then end of the year. 3. On the first day I set out math manipulatives that they have used in Kindergarten. Once they get their name tag, they choose an activity. This gives me time to chat with parents and help the nervous ones settle in. 4. I read Owen by K.Henkes and give students their own mini blanket (scrap material). Another good first day book is The Kissing Hand. Visit these sites if you are interested in starting your year off with a watermelon theme. At the beginning of the year there are a number of activities that you can do to help students get to know one another. Here’s one that will not only get them acquainted, but get them talking about what they read over the summer. Provide students with a copy of the worksheet. They will look for classmates who read a book that meets the various statements in each of the boxes. The student who read that book will need to do two things: sign their name on the line and write in the title of the book they read. Have students save these pages – they can provide them with a possible reading list throughout the school year. A fun and unique icebreaker activity. Find various units to start off your reading program. With my older students (high school and college) we play the "we're going to a picnic game." I start it out and say, "we're going on a picnic. I'm Kasi, and I'm bringing a kite." You then go to the next person and around the room repeating what each person said and adding their own name to the end. It's like the old game of telephone, but it helps them to learn each other's names and puts everyone at ease. They have to say an item that begins with the same letter as their first name. Appropriateness is a must, of course. See the lesson on respect above. A fun first day activity to celebrate the birthday of Francis Scott Key. On the first day of class I ask my class to open their journal and write The Star Spangled Banner. I then give them a copy of the correct words and talk about the flag and Francis Scott Key. It is really interesting to hear the verses the students write. They are usually laughing when they compare what they wrote to what the words really should be. This tip is something I saw done for a fellow student teacher. The host teacher put together a class autobiographical notebook to give to the student teacher on her first day. The notebook contained a picture of the teacher and a letter welcoming the student teacher to her classroom and describing a little about herself. The teacher had all of the students do the same. These items helped the student teacher quickly put faces and names together. Her first day was a little easier since she felt like she already knew something about each of the students and their teacher before she started. Submitted by: Claudia Pitchford [email protected] , an education student at the University of Illinois and the Illinois Education Association Student Program Public Relations Coordinator in Springfield, Illinois. This tip was published in the NEA's Weekly "Works4Me" Email list. A great way to welcome new educators to your building. "I put a coffee cup or small basket filled with goodies such as tea bags, coffee, candy bars, cookies and a note in each new teacher's mailbox. In the note, I welcome them and tell them where I can be located for help. If they don't show up, I seek them out and fill them in on important places, procedures and events that go on in our school. For the very shy new teachers, I get a composition book and correspond with them leaving the book in their mailboxes. One year, I put a small vase of flowers on each new teacher's desk. I helped one of our new teachers set up her classroom and she told me ten years later that act of kindness was the most important thing I ever did for her! I make a positive, non-threatening contact in some way to let new teachers know that I care and want to help." Submitted by: [email protected] , a mentor teacher at Fallbrook Union Elementary in Fallbrook, California. This tip was published in the NEA's Weekly "Works4Me" Email list. EMAIL us your favorite Back-to-School Activity!